It is a huge personal thrill to have Paul McVeigh visit the Literary Sofa. There’s a reason I’ll never forget the night Paul first crossed my radar in 2012. We were both in the line-up for one of Rattle Tales’ fantastic spoken word events in Brighton. It was my first public reading and it went much better than I expected. I could breathe again but not for long. Paul was on last and he stole the show with his performance of a piece which, like his debut novel The Good Son, was written in the voice of a young boy. The atmosphere was charged with emotion, the audience floored. I didn’t get to meet Paul that night but went away convinced he was an actor. Since then we have met many times and my first impression, both of his writing and his inimitable delivery, was absolutely spot on (except that he’s not an actor). He is genuine, generous and everything he does comes from the heart, with the enormous humour, tenderness and poignancy that are the making of The Good Son. I won’t finish with the usual mini-review because I think you can probably guess that I loved it and he is probably going to kill me for saying these things. Instead, you’ll find details of Paul’s many book-related activities below. Seek him out! I chose The Troubles as the setting for my debut novel for a number of reasons. It has always been a goal of mine as a writer to be as realistic and believable as is possible in a piece of fiction. Certainly as a first time novelist I wanted to be 100% sure of my material. I was born in Belfast in 1968 and had lived through The Troubles so I knew the setting from firsthand experience. I could vouch for the authenticity of my descriptions of the time, the streets, the atmosphere and way of life. There was a personal investment; I had a passion to share this extraordinary period in Northern Irish history with others. But how do you write a novel about a turbulent period of time, like the Troubles in Northern Ireland, and avoid making it a history lesson, or a political statement? Especially if it’s of such personal importance. Well, a setting is not a story. When you go to writing classes the most important thing you’ll be told is ‘character is story’. A strong setting needs a strong story and, more importantly, a strong character that will outshine it. Knowing my setting so well, I could relax around that and concentrate on creating a character. Mickey Donnelly took a long time to get right. He had to have a detailed home life, so that not all the action was based on the events outside, and to make it a personal, not a political, story. To counterbalance the difficulties he would face in and out of his home life I wrote the story in the first person, so we see the world through his eyes. He’s not giving us any complex political opinions just telling us the world as he sees it. The world is not a pleasant one. It’s grey, damaged, violent and poor. Mickey is the opposite of all the things that confront him. He has a full, rich, colourful, funny, internal world and his imagination spills out into his day-to-day life. This not only provides contrast to the setting but has the extra effect of adding to the pathos: How will this little kid and his world view survive the onslaught of so much negativity? His character is what makes this bleak setting bearable and, at the same time, makes us fearful for him and hopefully, emotionally engage with his story. I used to write and direct plays and I can see the influence in my approach to writing. The Troubles for me was like a stage set. It gave mood and, at times, symbolism, to enhance the understanding of the story. The events caused by The Troubles were the props on that stage, only there for me to use to tell the story. Mickey’s story. A boy who loves his mum and little sister and what he’s prepared to do protect them. When tackling a difficult, little known setting, making your character a foreigner, say, or, in this case, a little boy, bewildered by what he sees, allows the world to be seen just as the reader might. Choosing a perspective your reader can identify with, to an extent. Mickey has to navigate his environment and there are many obstacles he has overcome even to do something simple like get to the local shop. The streets of Ardoyne, where he lives, are dangerous. Riots erupt as a matter of course. Streets are barricaded, the British Army patrol the streets with rifles and the police are armed. Yet, in the streets, children play because that’s what children do. In the face of all that’s happening, we see how their little worlds continue but are affected by the environment too. One of the benefits of a setting like this is that every small, simple thing Mickey has to do in his day-to-day life can become a huge event, laced with tension. To combat the heaviness of all this the reader has Mickey’s buoyancy. His sense of humour is crucial to the overall tone and reflects his resilience and strength. He’s a funny kid who likes to joke and create imaginary scenarios based on his love of TV and American culture. Mickey is a dreamer but not for his own sake. His desire to protect his mum and sister gives him a depth and makes him heroic, in a sense. His love for them will drive him to make some choices that he has no idea of the consequences of because of his young age. We understand why he does what he does but we know, as adults, that they will come back to haunt him in the future. Finally, I think the crucial thing for me was to look at the setting and see what that bleakness was missing. I found that it was ‘hope’. The initial drafts of The Good Son were very dark and were dictated more by the environment impacting upon Mickey and his family. When I re-wrote the novel with the character in mind, having Mickey’s hopefulness stand strong, it changed the course of the novel entirely. It is not a perfect ‘everything’s going to be fine’ ending, but it’s not bleak either, it’s a complex end which befits the character and his environment. You’ll have to read it to find out! Thanks to Paul for these insights into writing his book. In my opinion he achieved everything he set out to do! 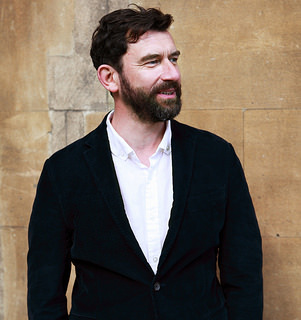 He is also the Director of the London Short Story Festival from Spread the Word, which will be taking place from 18-21 June with a stellar line-up. Paul hosts an incredibly useful and informative blog including details of events, courses and competitions in the UK and far beyond. As you know Isabel I’ve recently been to Belfast and did a tour of the area where The Troubles were rife so as you’d already suggested I’m definitely going to read Paul’s book. The issue of sectarianism also features in my own writing so this book is of particular of interest to me, especially as it’s dealt with using humour. 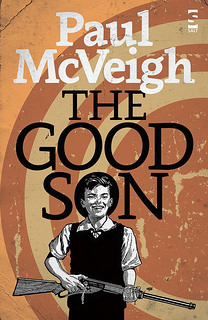 I can’t wait to read The Good Son! I can see some parallels between your book and Paul’s – hope you enjoy it! Definitely a book for the reading list. As someone who was also born in Belfast in 1968, I can’t wait to get my teeth into this. Hearing Paul read at the launch party, I can safely say that he has created a wonderful character in Mickey, and also completely captured the time and place he is writing about. It’s very interesting what he says here about setting, story and character and how they support and feed into each other. When all the pieces fall into place, a book comes alive. I think using a child as the ‘outsider’ voice for this story was inspired. I remember as a child being very bewildered by what was going on around me. There was so much unsaid, things you were supposed to know without being told, but at the same time, not knowing things, getting them wrong, was quite literally dangerous. At the same time, it’s great to see the (sometimes black) humour coming through as well. That’s something I also remember quite clearly! Rachael, I’m sure this book is going to be full of resonance for you and I can’t wait to get your take on it. I’ve always really enjoyed Paul’s short story work so looking forward to reading this. It will be fast tracked on the TBR pile.